This review has not yet been approved by the owner of this writing service. If you are the webmaster of Socialstudyhomeworkhelp.com, please Contact Us to approve or remove this review. One can only guess what the people who created this site were thinking. Or whom they saw as their potential customers, for that matter. To say that the site is empty and poorly designed is to say nothing – it consists of a single page looking like a half-hearted attempt at web-design made by a person who sees a computer for the first time in his life. No registration and personal account, no prices, no samples, no order form… It is easier to say what is present than what is absent – almost the only thing you can see on the site is an e-mail. Unsurprisingly, the site says nothing about the service’s pricing policy, you have to get this information from the customer support. According to the support, most cases fall within the range of $15-30 per page, with rare fluctuations in case of especially difficult or time-consuming tasks. Each assignment is evaluated separately, so don’t be surprised if two similar tasks are estimated in a completely different manner. The only way to contact the customer support is e-mail. It is also said that fax number is available on demand, but it is hard to imagine why anybody would want it. There are no samples on the site, so it is impossible to evaluate the quality of writing without ordering anything. You may ask for UK or US writers. One can only guess who will actually write your paper. I cannot imagine a person desperate enough to order anything from such a service. 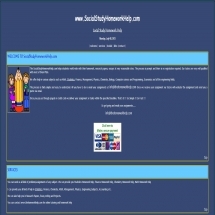 Yes, it is cheap, but in order to find it out you have to ask the support first, and if I have ever seen a site that doesn’t make me want to contact the people behind it, SocialStudyHomeworkHelp is certainly it. No refunds, no registration, no real-time customer support, a highly suspicious payment system that leads to another website, additional transaction charges you have to pay – it is hard to name a single decent thing about this agency.